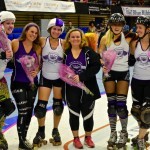 The Charlotte Roller Girls All-Stars suffered their second defeat of the season at the hands of the Lowcountry Highrollers when the two teams battled each other McAlister Field House in Charleston, South Carolina on February 18th. 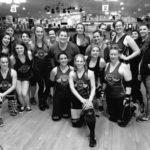 Lowcountry established an early advantage that would carry them through the entire bout, but not without Charlotte teaching them a few things of their own. 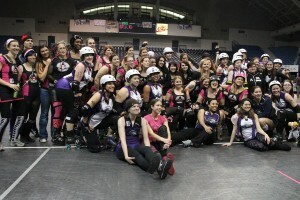 The bout ended with a final score of 81 to 153 in favor of the Lowcountry Highrollers. The first jam of the game established the quick pace that would characterize much of the bout as the Charlotte blockers took a knee at the jammer line, forcing a no-pack situation and an immediate start to the jam. Unfortunately, Lowcountry’s jammer, Tropikally Punch, managed to earn lead jammer status while Rosie Cheeksstruggled behind a wall of Charleston’s blockers. Rosie ran into more trouble when she was sent to the box on a major elbow leaving Tropikally Punch on a power jam during which she grabbed 23 points and put the momentum solidly on Charleston’s side from the start. Next up to the line was Charlotte jammer Shawn Shank Redemption against Lowcountry All-Star’s Lex McCusker. Shawn Shank Redemption was able to break through the pack first to earn lead jammer status and put Charlotte on the board with 4 points and call off the jam before Lex could score any of her own. In the next jam Charlotte’s Do U Juana took on Green-Eyed Sniper who also played a little “hit-it-and-quit-it” strategy picking up 3 more points before calling the jam. After a short referee timeout Shawn Shank Redemption went toe to toe with Tropikally Punch. 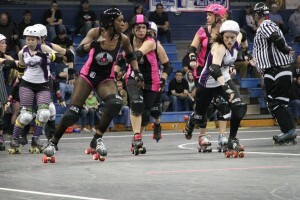 Shawn emerged as lead jammer but got trapped behind a pink wall of Charleston blockers in the front, while Tropikally scored 4 points before Shawn was able to call off the jam. At seven minutes into the first half Charlotte sent Bashionista to the line against Lex McCusker. The jam was off to a quick start with all players taking a knee in front of the jammer line. The advantage of this strategy went to Charlotte as Bashionista was able to break through the pack before the first turn and earn 2 points for the CLTRG All-Stars, but unfortunately was sent to the box. Lex McCusker, was able to take advantage of her power jam and add another 19 points for her team before getting herself sent to the box on a major track cut. Charlotte tried to gain back some momentum in the next jam by sending Rosie to the line and force a quick start to the jam by taking a knee. However, some confusion in the pack caused the refs to not call the no-pack immediately losing some time for Rosie. Charlotte quickly switched strategies and forced the no-pack call by skating forward while Charleston remained at the jammer line. Rosie was eventually able to get lead jammer and score 2 more points for CLTRG before Tropikally re-entered the jam, bringing the score to 8 to 49 in favor of Charleston. In the next jam, Charlotte’s Do U Juana broke through the pack first to earn lead and score a point, while her blockers were able to hold Lowcountry’s Green Eyed Sniper behind a wall for nearly a minute. After another referee timeout Shawn Shank Redemption took on Tropikally Punch again, who emerged as lead jammer and scored 2 points before the jam was whistled dead by the referee’s for a Charlotte injury on the track. Charleston, with a comfortable lead against Charlotte began to manipulate the clock time in the next jam attempting a slow pack start off the pivot line. Charlotte broke this strategy by skating forward 20 feet to force the no-pack call releasing jammers, Rosie Cheeks and Tropikally Punch. Charleston’s jammer took the lead with Rosie right on hear quads forcing Tropikally to call off the jam. Nearly halfway into the first period Charlotte’s Do U Juana took the jammer star against a new Lowcountry jammer, Goldee Headlocks. Do U Juana slid around the outside of the pack at turn two to gain lead jammer status with a 3/4 track lead on Goldee, but struggled in the pack on her first scoring pass and was only able to add a single point to Charlotte’s score. Charlotte jammer Rosie Cheeks ran into a bit of trouble in the next jam, as Charleston jammer Tropikally Punch took lead and Rosie got tangled up with her own blockers and then took a hard hit from Charleston blocker Sexual Chocolate as soon as she recovered from the friendly fire. Tropikally only managed to put 2 more points up on the board due to successful blocking on the part of the ladies in purple. With a little over 12 minutes in the period Do U Juana added another point to Charlotte’s total after skipping through the inside line and earning lead jammer status against Goldee Headlocks. In the next jam Shawn Shank Redemption got tripped up by a blocker and recycled back into the pack just as she was about to break through the front, allowing Green Eyed Sniper to score 9 points before calling off the jam. 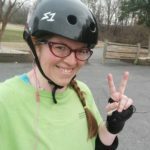 With less than 10 minutes left in the first half, the Charlotte Roller Girls began to gain a bit of momentum back on their side, holding Charleston to 65 points for the next 5 jams, while earning 21 points for themselves with Do U Juana, Bashionista, and Rosie Cheeks all earning consecutive lead jammer statuses. With 2 minutes left in the first period Do U Juana started on a power jam with Charleston’s Goldee Headlocks serving some penalty time from the previous jam. Penalty trouble started to affect both teams as Charlotte and Lowcountry skated with two blockers in the box. Do U Juana was able to pick up 4 points before earning herself a trip to the penalty box for a major track cut. Charlotte blocker’s Hellin Fellon and Ms. Guided Angel limited the damage to 4 points for Charleston as well by holding Goldee back at the front of the pack until they were forced out of play. After an extended referee timeout the final jam of the first half started with three seconds left on the period clock. Rosie Cheeks took the line against Green-Eyed Sniper, who was able to pull out just barely ahead of Rosie. Both skaters were able to add 2 points to their team totals before the end of the period. Penalty troubles continued to weigh on both teams in the second half. In the first jam of the second period, Rosie Cheeks spent a minute in the box for a major track cut after earning two points. That left Charleston jammer Green-eyed Sniper on a power jam and she racked up 20 more points for the Lowcountry Highrollers in those 2 minutes taking to total score to 38 to 91 in favor of Low Country. Charlotte stayed at 38 points on the board for the next 14 jams, despite earning lead jammer a few of those times. However, they were able to contain much of the bleeding as Charleston was only able to add 20 points to their total score in that time. The Charlotte jammers, including Rosie Cheeks and Shawn Shank Redemption, not having any luck getting through the pack, started to switch strategies and play defense as a blocker in some jams. Jammers Do U Juana and Bashionista also ran into some trouble when they were able to break through the pack first, but picked up minor penalties foregoing the lead jammer status, and control of the jam, to the Charleston skaters. 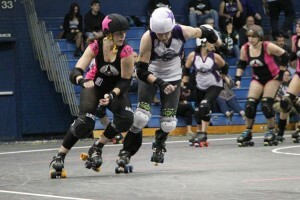 Rosie Cheeks was the first skater to break the streak with 13 minutes left in the game when she was able to earn lead jammer and score 3 points ahead of Green Eyed Sniper. Shawn Shank Redemption also managed to pick up lead jammer status in her next turn on the track but only after Tropikally Punch, who broke through the pack first, lost eligibility due to a minor penalty. Tropikally added three points to the board before Shawn earned lead status and ended the jam. Lowcountry tried to change their tactics and sent in Detroit Funk for her only jam of the evening against Rosie Cheeks, who earned lead jammer despite Charlotte being down two blockers. Rosie added 4 more points to the board before calling the jam to bring the score to 46 to 114. With less than 10 minutes in the game Do U Juana took the jammer star to skate against Tropikally Punch, who grabbed lead jammer status after Do U Juana picked up a minor elbow call making herself ineligible for lead. Do U Juana was able to pick up 7 points to Tropikally’s 3 before the jam ended. 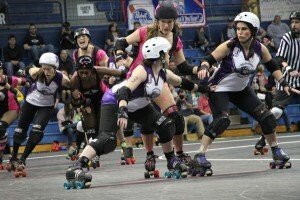 In the next jam Charlotte skaters worked to take advantage of every second left on the clock and started the jam on their knees to force a no-pack call and allow Rosie Cheeks to get out of the pack quickly as lead jammer. After a bit of jammer on jammer action Green Eyed Sniper took the positional advantage on the track forcing Rosie to call the jam without either jammer scoring any points. Bashionista took on Tropikally Punch in the following jam, earning herself lead jammer status and 3 more points for CLTRG All-Stars. Shawn Shank Redemption chipped away a little more at the point difference in the following jam adding 2 more to Charlotte’s total after taking lead against Lowcountry All-Stars jammer DJ Pain. With less than 5 minutes in the game Do U Juana battled Green-Eyed Sniper, who earned lead and 24 points in another high scoring jam for Charleston. Shawn Shank Redemption was able to break through the pack first in the following jam, but Tropikally Punch was too close on her heals forcing Shawn to call off the jam and leaving both jammers scoreless. The next jam saw another big jam for Charleston as Bashionista took a trip to the box, leaving Lex McCusker free to rack up another 15 points. With 1 minute and 2 seconds left on the period clock Do U Juana took the line against Tropikally Punch in the second to last jam of the bout. Things were looking good for Charlotte until Do U Juana was knocked to the inside of the track just before breaking through the front of the pack. Tropikally added 5 more points to the board before calling off the jam. Charlotte ended the game on a high note with just 12.6 seconds left on the period clock when Shawn Shank Redemption lined up against DJ Pain. Shawn broke through the pack first but picked up a minor track cut leaving DJ Pain with the lead jammer status. But DJ Pain earned herself a major penalty letting Charlotte finish the game on a power jam. Shawn earned 23 points for the Charlotte Roller Girls All-Stars in that final jam, despite a blocker deficit, including leaving Rosie Cheeks as the sole Charlotte blocker on the track at one point.